A reader of the Kitchen Table Gunsmith and I have had an interesting discussion regarding feeding problems with our FEG PA-63 9mm Makarov pistols. When I made some improvements to my PA-63 (refer to my article Improving the FEG PA-63 9x18 Makarov) I discovered that not all the Brown Bear jacketed hollow-point cartridges I purchased were seated to the same depth which caused some feeding problems. Reviewing that article, I discovered I did not fully explain what types of feeding problems I experienced, nor did I mention the cartridge overall lengths of the Brown Bear ammo. My apologies to my readers; this was an oversight on my part which I will correct with this article. I did some further investigation into these feeding problems, which I have detailed below along with their solution(s). In the process, I also provided some precise data. A failure to feed (FTF) with a semi-automatic pistol can be caused by several factors. 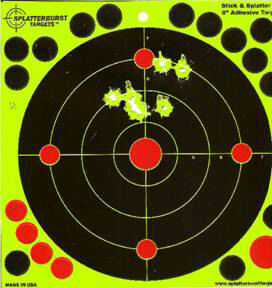 I identified which ones affected my PA-63 and eliminated them one-by-one until my pistol would feed ammo reliably. · Bullet Shape – Bullet shape is almost always the number one factor that causes FTF’s. 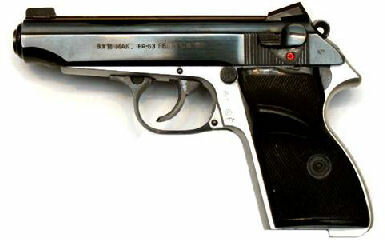 The PA-63 is a military/police pistol that was designed to take round-nose, ball ammo. Hollow-point ammo will often cause feeding problems because of the flat nose unless some changes are made to the gun. 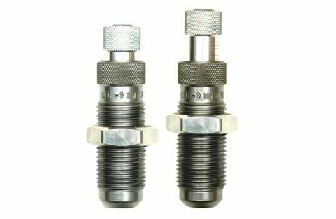 · Cartridge Overall Length (OAL) – Cartridge overall length can also cause feeding problems. A cartridge that is too long may get stuck in the magazine, and if too short it could be released from the magazine too soon and cause a jam. · Magazine – So many problems can be traced to faulty magazines, e.g. follower spring too weak or too strong, feed lips too sharp or damaged, feed lips releasing the cartridge too soon or too late in the feed cycle, dirt in the magazine that slows follower movement, or a damaged magazine body. These all need to be checked and if present, eliminated. Worst case, the magazine should be replaced. · Feed Ramp – If the feed ramp on the frame and/or barrel is damaged, too rough, too steep, too shallow, or too sharp the cartridge may not feed properly. 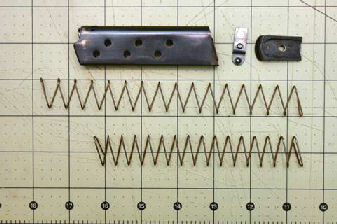 · Recoil Spring – A weak spring may not be strong enough to strip a cartridge out of the magazine, and a spring that is too strong won’t allow the slide to come back far enough to eject a spent case, or strip the next round out of the magazine. · Hammer Mainspring – If the hammer mainspring is too strong the slide may not cycle completely and cause a stovepipe jam, or not strip a cartridge out of the magazine. If too weak it could cause the slide to excessively batter the frame, which is not good for an aluminum alloy frame. For a semi-automatic pistol to function properly, all parts must be balanced and work together. I used four different cartridges with different bullets to troubleshoot my FTF problems. I wanted my pistol to feed all types of ammunition. · Brown Bear 115 grain Jacketed Hollow-Point (JHP) – I purchased 500-rounds at a gun show because I wanted the heavier, hollow-point bullet for personal defense. This ammo had problems (see below), but apparently is no longer being manufactured. · Hornady Critical Defense 95 grain Flexible Tip (FTX) – I purchased this for personal defense to replace the Brown Bear ammo because of its better expansion capabilities. · Fiocchi 95 grain Full Metal Jacket (FMJ) – I purchased one box of 50 rounds strictly for writing this article. · Handload – Starline Brass, CCI 500 small pistol primers, Lee 365-95-1R hard-cast lead round-nose (LRN), 3.6 grains of Winchester 231. I purchased brass and a Lee bullet mold for writing this article. I already had the Lee reloading dies. My pistol came with one magazine. I wanted some spare magazines so I purchased four from ebay. One of those magazines never would feed the Brown Bear HP ammo correctly. The magazines hold seven rounds, and when full, the first round of the faulty magazine would nose-dive and tip forward. Because the Brown Bear HP ammo has a flat tipped nose, the edge of the nose would catch on the sharp front edge of the feed ramp and prevent the slide from moving completely forward into battery. None of the other magazines had this problem. This was a good indication that the magazine spring had probably become weak. I purchased a set of three extra power magazine springs from Wolff Gunsprings for the Walther PP 7.65 and 9mm. Since the PA-63 is an exact copy of the Walther PP this spring fit perfectly. Notice in the above photo the original spring is a lot shorter than the replacement, but they both have the same number of coils. Unfortunately, during the live fire test this magazine still failed with the Brown Bear ammunition, but so did a good magazine. This is probably because of the shape of the bullet nose, not necessarily the magazine. This magazine will require more testing. The feed ramp was a bit rough and the front and side edges were sharp. The flat, hollow-point nose of the Brown Bear ammo would get caught on these sharp edges. I removed the ejector – which doubles as the slide lock – by pressing down on the retaining spring with a small flat-blade screwdriver, and pulling the ejector out of the frame. I used my high-speed rotary tool set to the lowest speed and a cone-shaped Cratex polishing bit to gently round off the sharp edges. Then I took a piece of 400-grit sand paper wrapped around a pencil eraser and smoothed the edges. I worked slowly and carefully because even though this is a hard aluminum alloy, it is possible to remove too much metal. As mentioned before, this pistol was designed for round-nose, ball ammo. I had no feeding problems with the Hornady Critical Defense loads because they are conical in shape. I also had no feeding problems with the Fiocchi or hand-loaded rounds because they both had round-nose shapes. 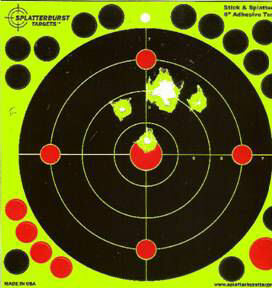 I had the most feeding problems with the Brown Bear hollow-point ammo. This was because the front of the hollow-point nose was flat and had an edge. This edge tended to get hung up on the sharp edges inside the pistol. Gently rounding the sharp edges around the sides and front of the feed ramp helped to fix this problem (see above). control! Through trial and error, I discovered that if the Brown Bear rounds were seated to a cartridge OAL of 0.965” or longer they would bind up in the magazine and cause feeding problems. 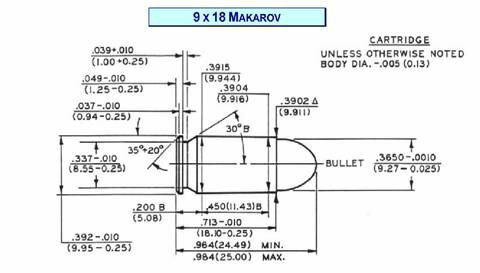 The SAAMI specifications for 9x18 Makarov cartridge OAL is 0.964” – 0.984” inches, but this is for a round-nose, ball cartridge. (My set of Lee loading dies shows 0.980” as the maximum.) I set my 9x18 Makarov seating die to seat the Brown Bear bullets to the shortest OAL of 0.955” so all the cartridges would be consistent. Seating the bullet deeper into the case prevented it from rubbing against the front of the magazine and fixed some of the failure to feed problems. I wanted to be sure my fix was not excessive. Seating a bullet deeper into the case can increase pressure. With the Brown Bear hollow-point bullet seated to an OAL of 0.955” I extrapolated what the overall length would be if the bullet was a round-nose. I took a photo of a Brown Bear cartridge and overlaid it onto a photo of a round-nose cartridge. I filled in the missing round-nose of the hollow-point bullet in blue. With this crude method, it appeared that if the bullet was a round-nose, the OAL would be 0.984” which is the maximum OAL per SAAMI specifications. So not only was my fix safe and within SAAMI spec, but it eliminated some of my feeding problems with the Brown Bear ammo. The Hornady Critical Defense cartridges are seated to an OAL of 0.975”. Because of their conical shape, I had no feeding problems when hand-cycling from a full magazine or during the live-fire test. I only fired 7 rounds because this is expensive ammo to use just for plinking. As a side note, I have a Taurus 24/7 PT Compact Pro in .45 ACP. The feed ramp on this pistol is very steep and won’t feed most hollow-point rounds because of the flat nose. The manual says it is designed for round-nose, ball ammo, but what is the point of making a compact pistol that won’t feed defense ammunition! Because of their conical shape, this gun had no feeding problems with the Hornady Critical Defense rounds. Because they feed in most firearms and have good expansion capability, Hornady Critical Defense ammo has become my personal defense ammo when I carry. The Fiocchi cartridges were seated to an OAL of 0.976”. I had no feeding problems with this ammo when hand-cycling from a full magazine because of their round-nose shape. 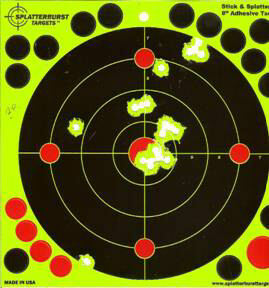 I also had no feeding problems during the live-fire test. I cast about 100 bullets using the Lee 365-95-R1 bullet mold and a hard-lead mixture. Out of the mold my hard-cast bullets weighed 104-grains and measured 0.367” in diameter. I lubricated the bullets with Lee Liquid Alox, which I hate to use because it makes a sticky mess in my seating die, and it takes time to wipe off the completed cartridges. I used 3.6-grains of Winchester 231 and seated the bullets to 0.976” OAL like the Fiocchi cartridges. I made sure to put a slight taper crimp on the case to prevent the bullet from being pushed deeper into the case during feeding. Again, because of the round nose shape I had no feeding problems when hand-cycling from a full magazine. After feeding, the lead bullet showed a mark where it slid along the feed ramp, but because of the taper crimp, the bullet did not get pushed deeper into the case. I also did not have any feeding problems during the live fire test. A quick note about seating lead bullets into semi-auto cases: Most modern seating dies also crimp the case. The die is designed with a constriction part-way inside so when pushed far enough into the die, the brass case meets the constriction and is crimped against the bullet. Crimping is an important step when loading ammunition. For revolver cartridges, it prevents the unfired bullets in other cylinders from backing out during recoil. If the bullets protrude beyond the face of the cylinder the revolver will jam. For pistol cartridges, it prevents the bullets from being pushed deeper into the case during the feed cycle. This can cause either feed problems, or excessive pressure, or both. Revolver-caliber seating dies use a roll crimp where the top of the case is rolled into a crimp groove in the bullet. Since most semi-auto pistol bullets headspace on the case mouth, a roll crimp could cause headspace problems. Because of this, pistol-caliber seating dies use a taper crimp where the mouth of the case is squeezed just a bit tighter against the bullet. This still allows the cartridge to headspace on the case mouth, but prevents the bullet from being pushed into the case during the feed cycle. For a pistol cartridge, when a lead bullet is being seated (pushed into the case) at the same time the case is being crimped, a small ring of shaved lead can be pushed ahead of the case mouth. The cartridge now headspaces on the ring of lead, which prevents the slide from going completely into battery. Chamfering the inside of the case mouth will not eliminate this problem. Jacketed bullets don’t have this problem because the copper jacket is harder than lead and won’t shave. 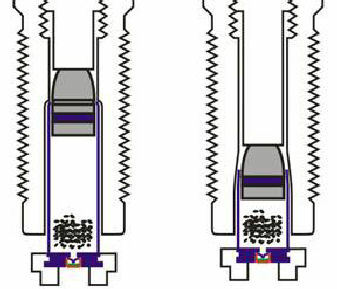 The way to avoid this problem is to separate the seating and crimping processes. If I don’t have a separate crimp die, I back out the seating die body so the crimp doesn’t touch the case mouth, then adjust the seating plug to seat the bullets to the proper depth. After all bullets are seated, I back out the seating plug, and then adjust the die body to crimp the cases. As an alternative, Lee Precision makes a factory crimp die for most calibers. When I use my progressive press to reload pistol ammo, the fifth station is a factory crimp die. I took the various ammo to the range and tested them for function and feeding. As mentioned in my previous article, the Brown Bear ammo kicked like a mule, but the Wolff 21-pound recoil spring I installed help absorb some of that recoil. This requires a little more strength to rack the slide, but makes the gun a pleasure to shoot. 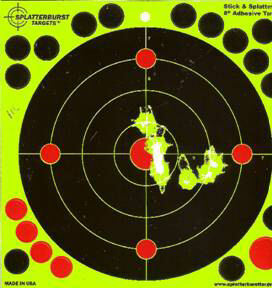 All rounds were fired at 7-yards (21-feet) from a rest and were accurate at that distance. The Brown Bear and my hand loads were right on for elevation, the other two were high. The Brown Bear cartridges experienced two failures to feed, one with the bad magazine even with the new magazine spring, and one with a good magazine. I brought another magazine with me and the other rounds fed perfectly from that magazine. Since I am still having feeding problems with the Brown Bear ammo, I may try to use my kinetic bullet puller to bump out the bullet and reseat to 0.960” – 0.963” cartridge OAL and see if I still have the feeding problems. My FEG PA-63 experienced feeding problems caused by bullet shape, bullet seating depth, and a bad magazine. I corrected each of these problems, and rounded and polished the sharp edges on the feed ramp to increase feeding reliability. Every gun is different and may experience all, some or none of the problems mentioned here. Based on what I saw on Gunbroker.com, the FEG PA-63 seems to be a popular little pistol, and is available in both 9mm Makarov and .380 Auto calibers. Because of its popularity, the prices just keep going up. The miniscule sights are terrible, especially for us folks with older eyes, and unfortunately Novak is no longer producing their .380 sights. If I was to purchase another PA-63, I would probably fabricate taller and wider dovetail sights like a 1911, and mill dovetail slots in the slide for the new sights. This gun is my summer-time carry gun, with which I would trust my life. It’s fun to shoot, and with a little bit of analysis, elbow grease, and parts replacement, it is now very reliable.